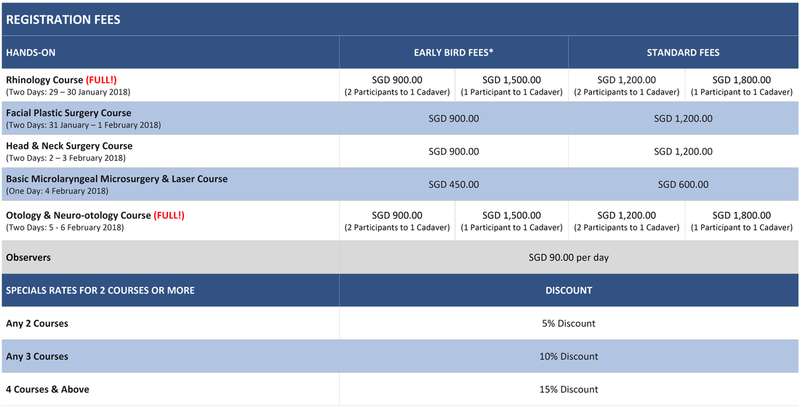 * EARLY BIRD = REGISTRATION AND PAYMENT RECEIVED BY 25 Dec 2017. ** Non-dissecting participants or observers will pay a nominal fee of $90 per day. *** There will be no refund if cancellation is made less than 2 weeks prior to the course. A refund of 50% will be allowed if cancellation is made from 2 weeks to 1 month prior to the course. All refunds will be made after the course. *Please note that discounted rate is ONLY applicable to Hands-on sessions and NOT observation. *No certificate will be issued to OBSERVERS. *Please await email notification from organiser before making payment. All cheques / bank drafts should be made payable to "Changi General Hospital Pte Ltd". Please indicate your Name and Contact Number clearly and that the payment is meant for "8th Foundation Surgical Skills Course In Otolaryngology" at the back of the cheque/ bank draft. Please note that all bank charges are borne by remitter (ordering customer). Please state on the remittance advice that the payment is for "8th Foundation Surgical Skills Course In Otolaryngology" and indicate your Name and Contact Number clearly. Any cancellation or replacement must be conveyed to the Organiser in writing.